Housed inside the landmark Holmbua along the beautiful harbor in Ålesund, Fisheries Museum is for the sea lovers and the history buffs. The exhibits in here tell the story of the development of fishery and the processing work involved. 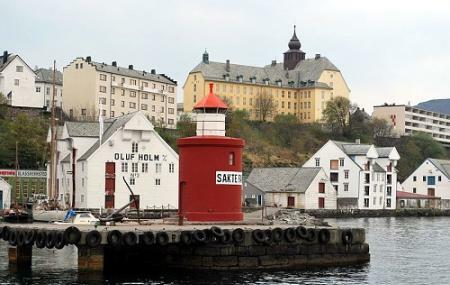 Stroll through the interesting displays, learning a thing or two about the production of dried cod and other fish products, make a quick stop to catch the smell of the cod oil which flows from the laboratory, and get your hands on some of the oldest equipment in place, large barrels included. How popular is The Fisheries Museum? People normally club together Art Noveau Centre and Alesund Aquarium while planning their visit to The Fisheries Museum. Obviously a labour of love for the owners. Staff members very pleasant and spoke better English than me! Very well presented but nowhere near enough explanatory labels in English beside the objects. It also seems to be more about how to make cod liver oil, and their barrels, than actual fishing. Because I didn't know what most of the various bits of wood and rope, etc., are actually for, I began to just walk past most of the displays. There is also a beautifully preserved fishing boat moored beside the building but it isn't obvious if it's part of the museum. Would have been better if all the information would have been available in English.